Yup, DMX mentioned banding but are not getting aggressive with accumulations. Said maybe iso 3". Did mention potential advisory but with current wind chill headlines they dont want confusion. Several inches of very dry snow falling on frozen concrete during rush hour equals disaster. I’m already thinking about working from home tomorrow so I don’t have to deal with that madness. 2-5” in my point and click for tonight thru tomorrow morning. Best solution bud. I do that all the time, if I must. I assume these are with predicted ratios? Man thats a dry looking GFS run. Is it even gonna snow lol? Seems a bit too aggressive if you ask me. First storm is drying up. Second storm is south. Let’s bring back the 50s so I can use my new golf membership and new clubs. This cold weather is useless if there’s no snow. 12Z NAM is lighter here for Saturday. Models are very weak with the Wednesday night/Thursday wave. Here's the UK, which only has about 0.03" in CR. Be lucky to get flurries out of this. Models are really drying up. The UK is more robust Friday, with a more sw track. Here's the UK map through the weekend. A last wave adds a bit to Nebraska over the weekend. The 12z euro continues to show the more robust Friday wave a bit farther northeast, missing Nebraska. The total precip map isn't loading, but here's the 10:1 snow map through the weekend. NWS Quad Cities has 1-2” for tomorrow here; Des Moines has 2-3”; and LaCrosse has 1-2” here. I’d side even more towards the 1” mark than anything, but we’ll see what happens. Yup looking way dry. See what the radar does this evening. Forecast totals down to 2-3” here. Will probably be down to an inch by this evening. I always thought the initial forecast totals were a bit too high given the dry, cold air. Temps will be in the low single digits above 0F when the snow falls. My .02 is that we can’t overlook the fact that 00z and 12z GFS have been relatively consistent with storm track and placement since last Thursday. GFS also caught on to these brutal temps. Appears that EURO is playing catch-up this time around. Euro is playing catch up? Please elaborate. Euro has been drier all along. GFS prolly more accurate with temps. 15z SREF plumes with a mean of 4” at MSP. No real high or low outliers skewing the mean either. Nice cluster between 3-5”. We’ll see how this unfolds once the radar lights up. The models were fairly consistent for many days leading up to this. Would be a shame for this thing to die out now. I wonder if DMX will still issue advisory. They have a special weather statement now regarding the expected snow. Craig- The GFS has been crap for amounts. You live in Omaha. Look out your window and see all the snow we didn't get that was forecasted. Euro has been much more accurate on amounts of snow. Placement has been different between the two. What? I've been dissing the GFS this whole week, and the Euro is the drier(and more realistic) of the two models. If you were expecting 12" of snow in single digits, you're only fixing to be let down. Also I want you to justify this Facebook post of yours. Seriously?? Euro has a stripe of .1-.2” qpf directly through Iowa City and Cedar Rapids Friday. With high ratios could be a 2-4” event. I’ll hold my breath. Look at these amounts the GFS has kept spitting out for this week. Some of these of course include next weekend yet to come, but it seems we're seeing a trend here with the GFS. Way too wet!! This was the GFS forecast through tonight into Thursday for only 84 hours out. 8" for Omaha? Those GFS maps make no sense. COD must be using 50:1 ratios to get those snow amounts. What time on Friday does that begin in the Cedar Rapids area? Looks to start after noon on Friday per the euro. DVN completely punted on the Friday forecast in the AFD. Still confused if I'm on the right storm lol but the storm on the GFS is starting to trend towards the EURO. King might win out on this, clearly that's what the WFO out here has been going with. No Bueno for us out here in LNK. Funny enough, I had 4 people send this post to me and say "omg how". 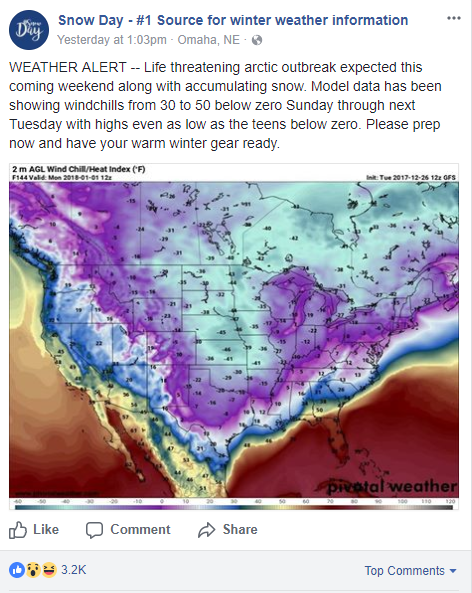 I just don't like the wording, I have no problem showing it, but instead of saying "prepare now" why not just say "potential for this... stay tuned"; my friends are buying into it because of the wording, and they shouldn't be. They are high ratios(some kind of Kuchera method), but even if you look at actual qpf amounts, it was forecasting nearly .6" of moisture in Iowa on that bottom run of the 120 hour through Saturday. Like I said, GFS has been way too wet. Norfolk reporting some light snow at 4 PM. It will get very active! Prolly nada, but cannot rule out an inch or 2 for MBY. IMHO, I think the dry air will eat out any moisture. yeah everything keeps getting lowered once we get closer to the actual event. The NAM is now spitting out .25-.3" of qpf in Iowa through Saturday's storm which seems the most reasonable if even that won't end up being a bit too high. 18Z GFS now is in that range too, when it used to show 2x that amount. With these cold temps and high ratios, that could be 4-5" if someone is lucky enough to get hit by both waves. it seems though the ratios haven't always been working out. I know our airport reported an 8:1 ratio on the snowfall before Christmas when the temps were in the teens. Until we get actual southwest flow that was supposed to be happening by now and heck even a bit warmer temps, I don't see anything more than these nickel and dimers continuing. But hey, at least it's horribly cold!! It already is active. We're getting "clippered to death" with a storm somewhere in this region every couple of days. Nice to see storms, bad if you'd like to get a big snowstorm or blizzard. The issue is if we're wanting a big storm, it's not going to happen in this pattern. I don't see anything more than these nickel and dimers continuing. You could have a blizzard with a saskatchewan screamer or alberta clipper. Believe it or not, the 1888 blizzard was brought on by an alberta clipper. I would love to see one of those; but your right we need a colorado low to get a true blizzard. Honestly, if we manage to get one of those this winter I would be happy; this winter has already been better than last years IMO.